Staff Selection Commission conducted the Combined Higher Secondary (10 + 2) Examination, 2015 (Descriptive Paper) on 18.09.2016 for recruitment to the post of Data Entry Operators and Lower Division Clerks at various centers all over the country. A total of 46,125 candidates appeared in the said examination. 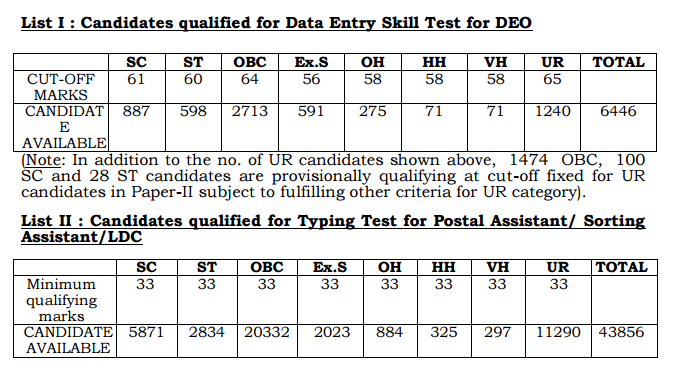 Based on the cut-off fixed in Descriptive Paper( Paper-II) by the Commission, 6446 candidates qualified provisionally for skill test for Data Entry Operator and 44,586 candidates for Typing Test for Post of Postal Assistant/Sorting Assistant and Lower Division Clerk as per below given cut-off. The skill test will be taken on computer. The ‘Data Entry Speed’ Skill Test would be qualifying in nature. Candidates allowed to take this test, will have to qualify the test at the prescribed speed on computer, to be provided by the Commission or the agency authorized by the Commission to conduct such skill test at the centre/venue so notified. 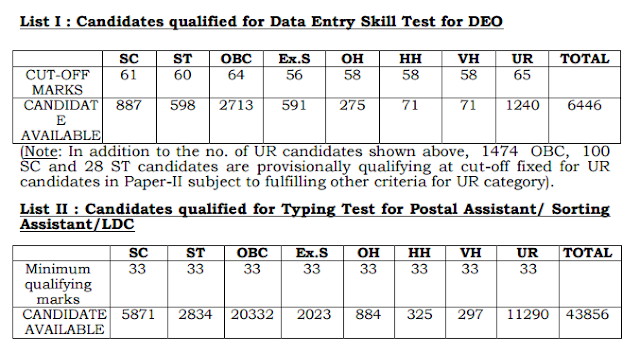 None of the candidates including PH candidates who qualify in the written part of the examination will be exempted from the skill test as passing of the skill test is pre-condition and one of the essential qualifications for appointment to the post of Data Entry Operator. Only such candidates who qualify in the skill test at a speed of not less than 8,000 key depressions per hour will be eligible for being recommended for appointment as per their position in the merit list. The duration of the said skill test will be 15 (fifteen) minutes and printed matter in English containing about 2,000 - 2200 strokes/key depressions would be given to each candidate who would enter the same in the computer. The Typing test will be taken on computer. Typing test will be qualifying in the nature and will be conducted only in English or in Hindi. English Typing @ 35 w.p.m. (Time allowed 10 minutes) (30 minutes for VH candidates) Hindi Typing @ 30 w.p.m. (Time allowed 10 minutes) (30 minutes for VH candidates). (35 w.p.m. and 30 w.p.m. corresponds to 10500 Key Depressions Per Hour/ 9000Key Depressions Per Hour respectively. Result of this examination is available on SSC’s Website http://ssc.nic.in. Marks of qualified & Non-qualified candidates will be made available on the Commissions website shortly.